After my successful experiment with cooking chicken in cider and apples (recipe can be found HERE), I decided to use these ingredients to prepare pork tenderloin (also known as pork fillet). As the aroma of my the five spice mix, that I’ve recently used in my upside-down cake, was still fresh in my mind, I decided to use it in this dish as well, and did not regret it. It added wonderful aroma that combined beautifully with all the other ingredients. The cider and apples prevented the lean cut from drying while roasting, and added a nice sweet yet slightly acidic flavor to it as well. 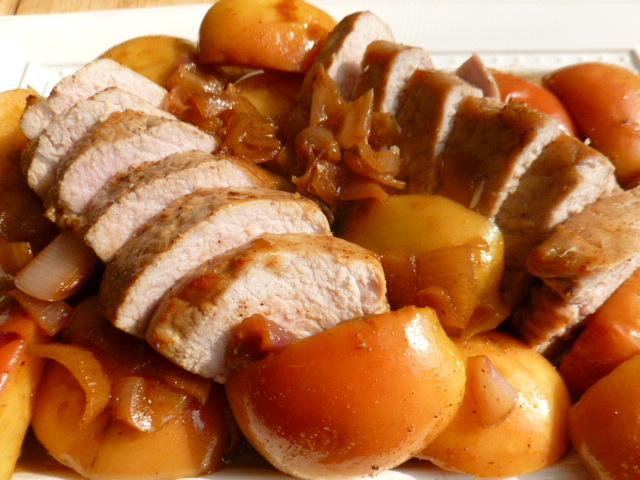 The pork turned out moist and tasty, while the apples with shallots made for a great side dish. Try it and enjoy. * I’ve used “touch of sea salt” pork tenderloin from Hatfield farms, which also contains a small amount of turbinado sugar. If you use a tenderloin without such additions, adjust the seasoning accordingly. * Alaea, Hawaiian red salt, is an unrefined sea salt that has been mixed with red volcanic clay. It’s great for roasting and adds an earthy flavor to the dish. It is available in specialty stores or online. If you can’t find it, it can be replaced with any other coarse sea salt. 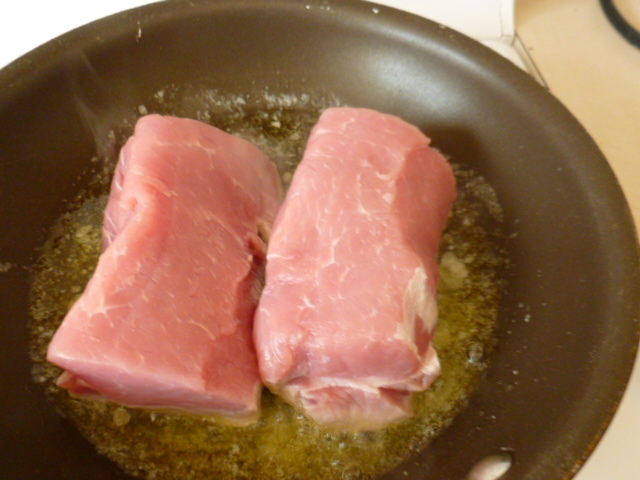 * A small turkey breast can be used instead of the pork tenderloin. 1. Preheat the oven to 400F (205C). Line a 12” x 8” (20.5cm x 30cm) pan with aluminum foil and baking paper. 2. In a small bowl, mix the brown sugar, Alaea salt, five spice powder and four pepper mix. 3. 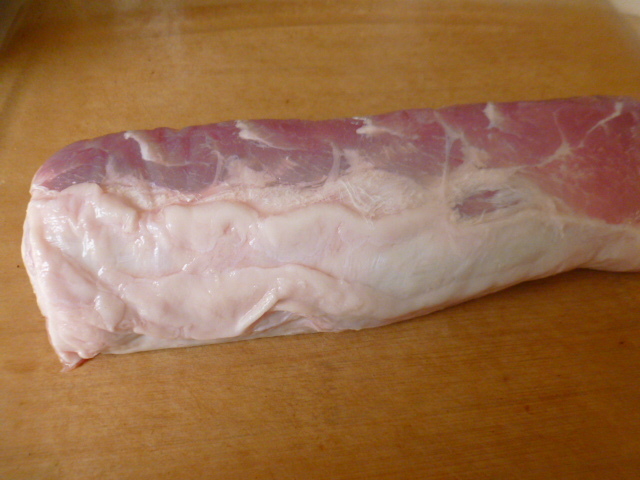 With a sharp knife, trim off the silver skin and fat layer from the tenderloin. Cut in two and sprinkle the salt all over. Melt 2 Tbs of the butter in a large pan over medium-high heat. Add the tenderloin and fry from all sides, for 2-3 minutes, until lightly golden. Keep aside, in a warm place. 4. Add the rest 1 Tbs butter to the pan, add the shallots, mix and sauté for 2-3 minutes, until they soften. Mix in the apples and sauté for about 1-2 minutes. 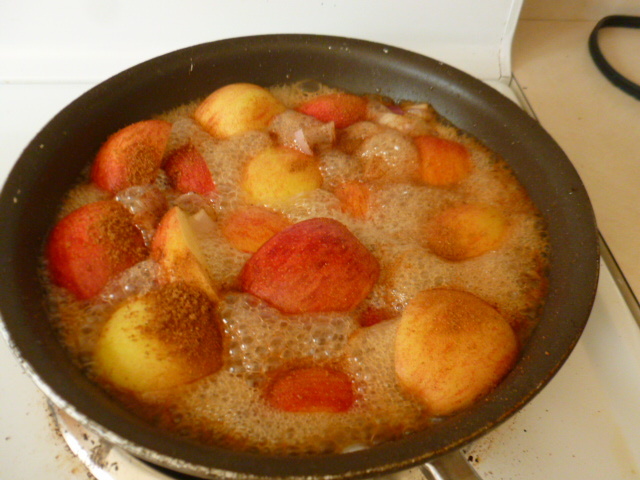 Add the sugar-spice mix and cider, mix and bring to a boil. Lower the heat and cook for about 5 minutes, until the apple begin to soften. 5. Place the tenderloin and apples in the prepared baking pan. 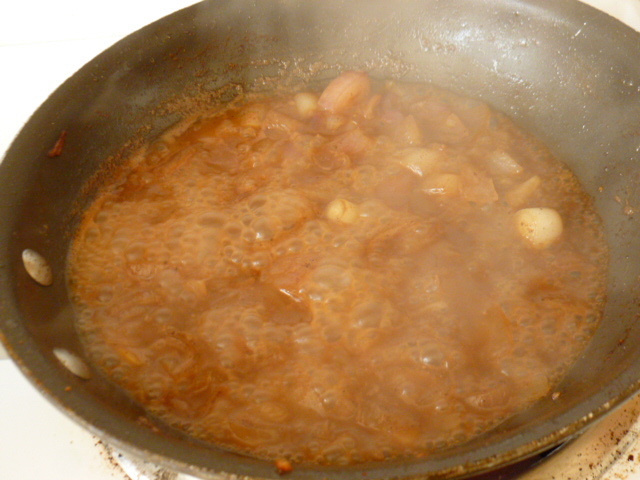 Bring the liquids to a boil and cook for 1-2 minutes, to reduce the sauce a bit, then pour it on top. 6. 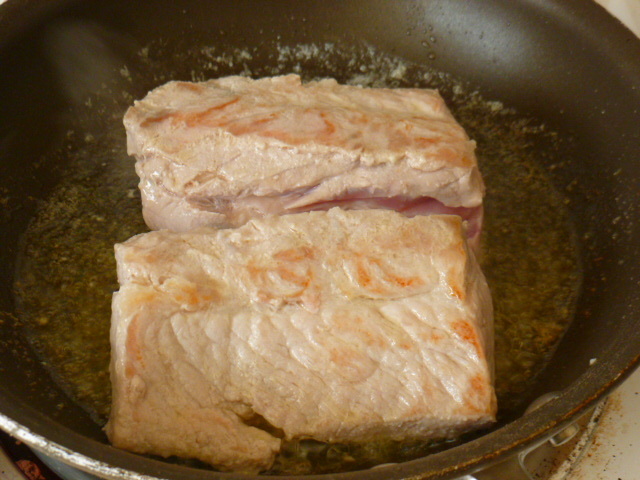 Place the pan in the oven and roast for about 15 minutes, basting occasionally, until the pork is done (If checking with a meat thermometer, it should register an internal temperature of 150F (66C)) and the apples are soft, but still keep their shape. 7. 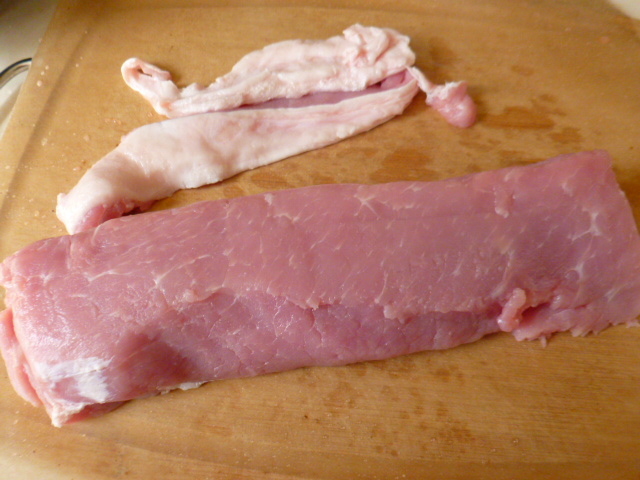 Let the pork rest for 2 minutes before cutting. 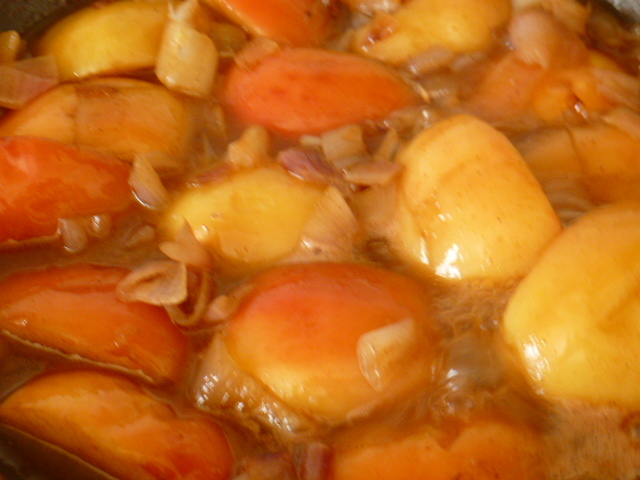 Arrange on a warm serving plate, add the apples and sauce and serve immediately. 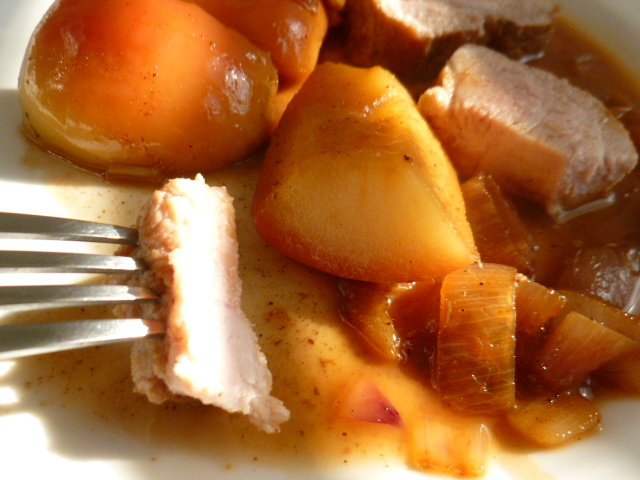 What is it about apples and pork that just naturally come together in such a delicious way? 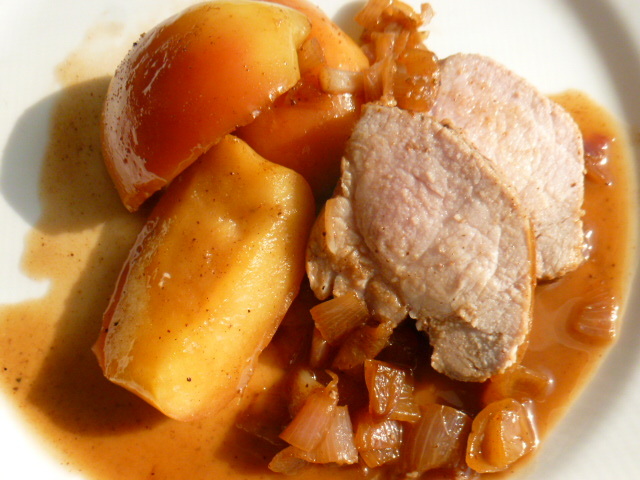 apples and pork are always a good pair! Yes please, it looks great. A wonderful flavor combination. Merry Christmas to you, I hope you are having a wonderful day. Thank you Karen, I’m glad you liked the dish. I agree Judi, pork and apples work so well together. The hard cider is lately my new favorite when it comes to braising. It definitely adds a nice kick to the dish. 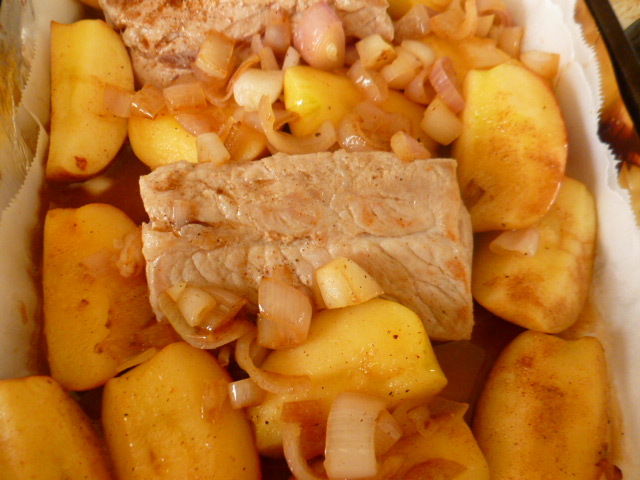 Pork and apples were made to be cooked together. A lovely recipe and one that we shall try. I’ve never thought of using 5-spice with pork and apple braises. I think it a great idea. Have a safe and Happy Ronit. I’m sure the recipe goes well with pork as well.